Sprinkle a cutting board or flat surface with flour. 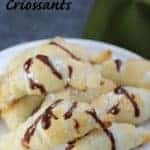 Roll out crescent rolls and use a pizza cutter or knife to cut each sheet into long triangles. Place approximately 2 tbsp of REESE Spreads on the wide end of each triangle. Beginning with the wide end of each triangle, roll the dough into a croissant shape. Place each on the parchment paper on the cookie sheet, and turn in the edges of the dough slightly to make a "U" croissant shape. In a bowl, whisk the egg and then brush the egg mixture on each croissant. Bake for 17-23 minutes, until the croissants are golden and flaky. If you prefer, sprinkle each with some icing sugar and REESE Spreads warmed up in the microwave for 10 seconds. Leftovers can be stored up to 3 days in a sealed container.